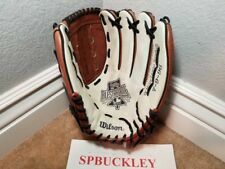 Wilson A2000 Conform Dial March Glove of the Month GM31 Limited Edition 12.5"
A2000 GM31. Collectors Glove. Patented Dial Fit System. Made in Japan. Dual Rolled Welting. GLOVE IS FOR A RIGHT HANDED THROWER, GLOVE FITS ON LEFT HAND. MODEL # 1921 CONFORM. MODEL SPECIFICS: Premium Abyssinian cabretta leather provides soft feel. Ultramate Velcro provides tighter closure and hold throughout play.Reversed thumb seam smoothens feel between palm and thumb. Authorized Wilson Golf Dealer. Condition: New. New standard in comfort and performance, Premium Abyssinian cabretta leather.